it is the unofficial site about Nea Apollonia!update day by day!everything you want to know about! 40:37-40:41N, 23:21-23:36E; 37 m above sea level. ake Volvi is one of the numerous Macedonian lakes in northern Greece, and is located about 40 km northeast from the city of Thessaloniki. The catchment is mostly barren, mainly used for grazing except a small portion under cultivation, and without any urban or industrial development. Some dry rivers drain the catchment area, while a small stream is the only outflow. 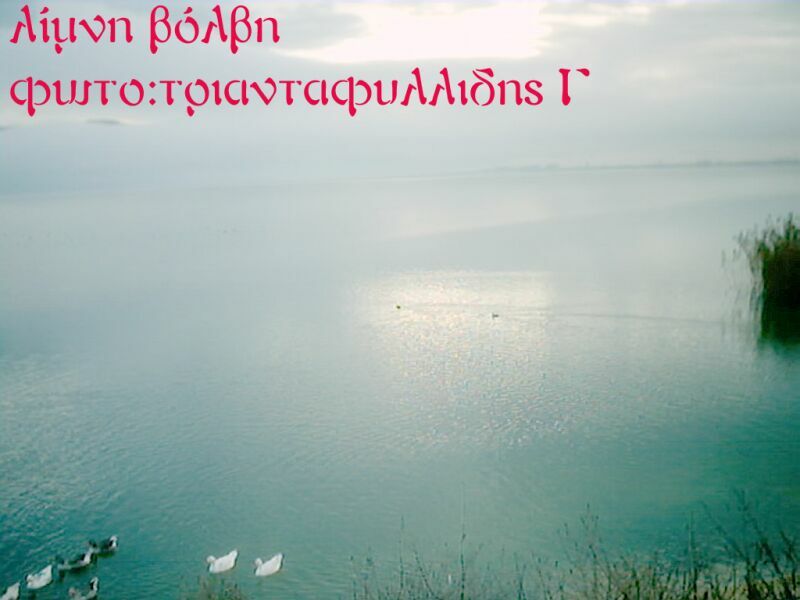 There are times when the lake receives water from a neighboring lake, Koronia. he Lake Volvi area is characterized by a mild Mediterranean climate with rainy warm winters and dry hot summers. The lake never freezes over in winter. The precipitation is the largest in November - December and the least in August. High floods may sometimes occur by unusual heavy rainfall, in contrast to severe droughts when minimum inflow reaches the lake. ake Volvi is a warm monomictic lake with thermal and chemical stratification established in May. During the stratification period, the epilimnion is about 11 m thick and microstratifications develop within it. By September, the overturn is initiated and isothermal conditions prevail in winter and early spring. The maximum surface water temperature is measured in August and the minimum in February. The concentration of oxygen in the epilimnion ranges approximately from 8 to 10 mg l-1 and the maximum concentration is recorded during the isothermal conditions. During the stratification period the hypolimnion is devoid of oxygen. ecently, blue-green algal blooms have been observed in early summer after a very dry period when the external input of nutrients decreases significantly. 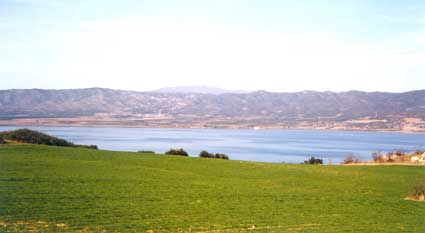 Therefore, it is concluded that the nitrogen fixation by N2-fixing cyanophytes and the release of ammonia nitrogen, phosphorus and silica from the anoxic sediment may be the most important sources of nutrient supply in this lake during the dry, warm period when the highest phytoplankton biomass is developed (1, 2). Names of main islands: None. Number of outflowing rivers and channels (name): 1 (unknown). 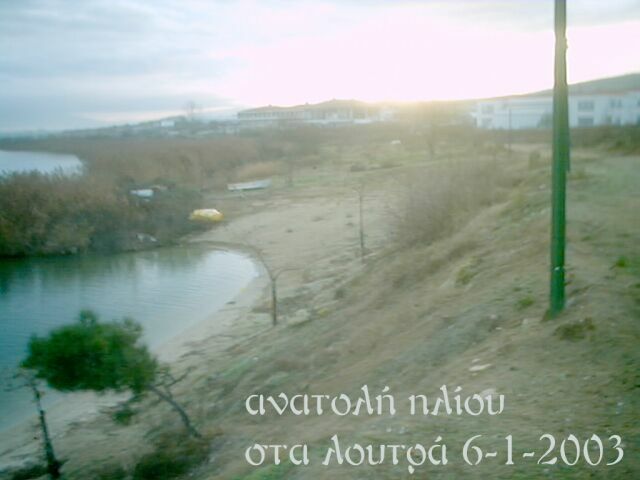 Number of hours of bright sunshine (Athens): 2,655 hr yr-1. Seasonal variation of transparency (a) and pH (b)(2). Vertical and seasonal distribution of NH4-N concentration [micro g l-1](2). Vertical and seasonal distribution of NO3-N concentration [micro g l-1](2). Vertical and seasonal distribution of PO4-P concentration [micro g l-1](2). Cyanophyta (Anabaena aphanizomenoides, A. circinalis, A. flos-aquae, Anabaenopsis circularis, Aphanocapsa delicatissima, Aphanothece clathrata, Chroococcus limneticus, Coelosphaerium kuetzingianum, C. minutissimum, Cyanocatena planctonica, Cyanogranis ferruginea, Cylindrospermopsis raciborskii, Lyngbya circumcreta, L. limnetica, Merismopedia punctata, M. tenuissima, Microcystis aeruginosa, M. incerta, Oscillatoria limnetica, O. subtilissima, Pseudanabaena limnetica, Radiocystis geminata), Chlorophyta (Actinastrum hantzschii, Coelastrum astroideum, C. microporum, Coenococcus polycoccus, Coronastrum lunatum, Crucigenia tetrapedia, Crucigeniella apiculata, Dichotomococcus curvatus, Dictyosphaerium pulchellum, D. tetrachotomum, Didymocystis planctonica, Didymogenes palatina, Elakatothrix genevensis, Franceia ovalis, Kirchneriella lunaris, Koliella longiseta, K. planctonica, Lagerheimia ciliata, L. genevensis, Micractinium pusillum, Monoraphidium arcuatum, M. contortum, M. griffithii, Nephrochlamys willeana, Nephrocytium lunatum, Oocystis lacustris, O. marssonii, Pediastrum boryanum, P. duplex, P. simplex, P. tetras, Planktosphaeria gelatinosa, Quadricoccus ellipticus, Scenedesmus acuminatus, S. alternans, S. ecornis, S. intermedius, S. opoliensis, Tetraedron caudatum, T. minimum, Tetrastrum heteracanthum, Closterium aciculare, C. acutum, Cosmarium depressum), Euglenophyta (Euglena sp. ), Chrysophyta (Cyclotella sp., Melosira granulata, Rhizosolenia longiseta, Stephanodiscus hantzschii, S. rotula, Nitzschia acicularis, Synedra acus, S. ulna, Mallomonas sp. ), Dinophyta (Ceratium hirundinella, Gymnodinium spp. ), Cryptophyta (Rhodomonas minuta), Haptophyta (Chrysochromulina cf. parva). Daphnia cucullata, Bosmina longirostris, Polyarthra sp., Keratella sp. Changes in the number of species belonging to the most numerous algal classes and the total number of phytoplankton species (2). Annual cycles of cyanophytes, diatoms, cryptophytes, chlorophytes, dinoflagellates and haptophytes in the lake (2). Seasonal variation of phytoplankton biomass (1). Percentage contribution of the different algal groups to the total phytoplankton biomass (1). Mostly barren area used for grazing, only a small portion is cultivated. Main types of woody vegetation: Oak, fruit gardens. Main kinds of crops: Wheat, maize, barley. Levels of fertilizer application on crop fields: Moderate. Sight-seeing and tourism, and recreation. Nuisance caused by eutrophication: Slight algal bloom. b) No sources of significant pollution. Moustaka-Gouni, M. T. (1988) Arch. Hydrobiol., 112: 251-264. --- & Tsekos, I. (1989) Arch. Hydrobiol., 115: 575-588. Location: Lake Koronia and Lake Volvi are situated in northern Greece, at the central part of Makedonia, 30-50 km from Thessaloniki. Importance: The lakes and their wider area possess a high biological diversity at both the species and habitat level. There are some 336 different plant species, 14 reptiles, 34 mammals, 5 amphibian species and 29 fish species at the site. Ten plant species in Lake Volvi are endangered including Butomus umbellatus, Vallisneria spiralis, Potamogeton nodosus, P. perfoliatus, Nymphaea alba, Hydrocharis morsus-ranae, Ceratophyllum submersum, Trapa natans, Azolla filiculoides, Salvinia natans and Ricciocarpus natans. Some 33 plant species are considered as rare including Alisma gramineum, Arundo donax, Juncus compressus, Najas minor, Ruppia maritima, Lycium europaeum, Sparganium erectum erectum, Rumex palustris, Lysimachia vulgaris, Samolus valerandi, Salix cinerea, Gratiola officinalis and Berula erecta. Two fish species, Leuciscus cephalus macedonicus and Vimba melanops, and the mammals Canis lupus, Pipistrellus kuhli and P. nathusii are included in the Greek Red Data Book. Six fish species are rare: Alosa alosa, Aspius aspius, Rhodeus sericeus amarus, Barbus plebejus, Chalcalburnus chalcoides and Cobitis taenia. The fish species Alosa macedonica and Chalcalburnus chalcoides macedonicus are endemic. Approximately 200 bird species have been observed at the site and at least 40 breed in the area and 62 are protected under EU legislation. 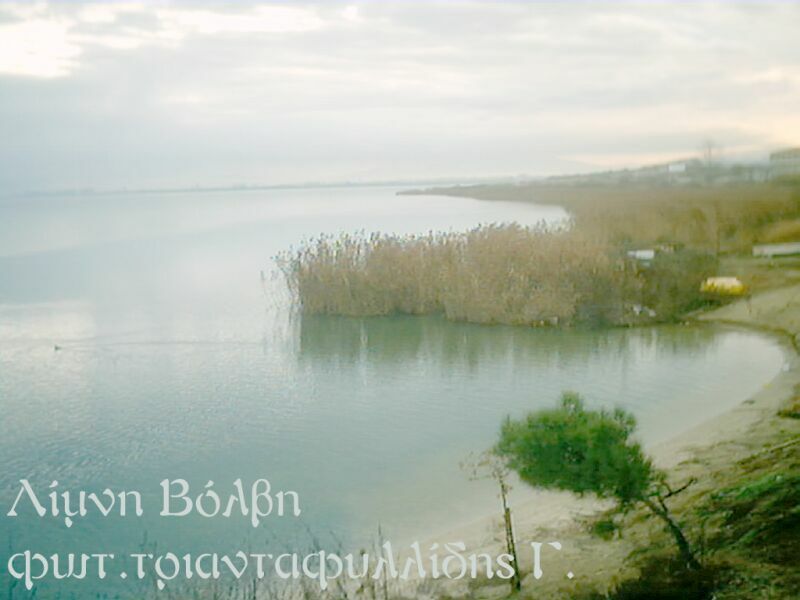 Lake Koronia is also one of the most important wintering sites for waterfowl in Greece. Notable wintering species are Podiceps cristatus with a mean number of 1,924 individuals over the preceding 12 years, Casmerodius albus, and the globally threatened species Pelecanus crispus and Phalacrocorax pygmeus. The wetland includes two freshwater lakes connected by an open channel, and irrigated agricultural land. The lakes are fringed with marsh, reedbeds and riverine woodland. Biological/Ecological notes: Main tree species are Alnus glutinosa, Platanus orientalis and Populus alba, while Salix alba and S. fragilis, Populus nigra, Ficus carica, Pyrus amygdaliformis, Fraxinus ornus, Cornus mas, Nerium oleander, Vitex agnus castus and Juglans regia also occur. The shallow waters and the reedbeds exhibit high primary productivity. Large areas fringing the lake are covered by submerged aquatic vegetation and reeds, and form feeding areas for large number of fish species. Aquatic, marsh, and riparian plant species are the sites representative flora. Najas minor, Ricciocarpus natans and Potamogeton obtusifolius are new species for the Greek flora, and Salvinia natans, Salix viminalis and Trapa natans, are protected by national Presidential degree. Myriophyllum spicatum, Ceratophyllum demersum and C. submersum provide valuable habitats for fish species. Locally extensive reed beds of Scirpus maritimus and Phragmites australis occur around the lakes and along the riverbanks. The area has long been important for bird species, but it became even more important as a bird habitat after 1957 when the two small lakes of Mavrouda and Lantza to the north of Volvi were drained. Breeding waterbird species include Nycticorax nycticorax, Ardea purpurea, Ixobrychus minutus, Egretta garzetta Tadorna ferruginea, Accipiter brevipes, Buteo rufinus, Aquila pomarina, Circus aeruginosus, Hieraaetus pennatus and Coracias garrulus. Also present are Ciconia ciconia - whose breeding population in the area is among the largest in Greece, and Ardea cinerea that is breeds in two colonies of approximately 70-80 nests. The amphibians Bufo viridis, Hyla arborea and Rana balcanica, the reptiles Agama stellio, Lacerta trilineata, Lacerta viridis and Natrix tessellata, and the mammals Myotis blythi and Myotis are protected by international conventions and are found at the site. The otter Lutra lutra formerly occurred but there is currently no evidence for its continued presence. Some important wintering waterfowl species are Aythya ferina with a mean number of 1,352 individuals in the preceding 12 years, Tadorna tadorna, Anas platyrhynchos and Fulica atra. In recent years small populations of Phoenicopterus ruber (10-50) appear frequently at Lake Koronia resting or feeding during their migration. The Apollonia forest hosts both Ciconia ciconia and C. nigra, and at Redina Gorge, to the east, Circaetus gallicus, Aquila Chrysaetos, Bubo bubo and rarely Neophron percnopterus have been observed. Hydrological/Physical notes: In the lowland coastal zone the soils are alluvial, fine-grained, and of considerable depth and high fertility. Acid brown forest soils predominate in the wider area. Lake Koronia freezes in winter, is eutrophic and highly turbid, with a shortage of oxygen during summer. Lake Volvi, which does not freeze in winter, is poor in nutrients and clear, and is well oxygenated even in the hottest months. Lake Koronia lies at 75 m above sea level, and Lake Volvi lies at 37 m above sea level. During the last 10 years the volume of Lake Koronia has decreased dramatically due to a decrease in precipitation and to the over-consumption of the lake water. The low water level of Lake Koronia severed the natural connection between the lakes. This was artificially restored by a channel constructed in 1980. Koronia is shallow (1 - 4 m at the shore, and up to 6 m at the centre) but Volvi is deeper (10 - 24 m). Lake Koronia has a catchment area of 1,308 sq km and Lake Volvi has a catchment area of 782.5 sq km. The climate is mesothermic with a dry period during the hot summer, whereas at the nearby uplands, relatively harsher weather conditions prevail. The air temperature fluctuates; January is the coldest month (mean temperature of 4°C) and July the warmest (mean temperature of 26°C). The mean annual precipitation around the lake is approximately 415 mm. Human Uses: Both lakes are primarily used for irrigation for (mainly) vegetable crops and maize. The areas around the lakes are intensively grazed, especially around Lake Koronia, while around Lake Volvi grazing fields are under less pressure. Net fishing activities occur during the whole year except during the fish-spawning period. Though very important in past decades, the commercial value of the fish production today, is low, and the income from fishing generally supplements other forms of income. Some 90% of the lowland in the surrounding catchment is cultivated with cereals, maize, tomato, and tobacco. Other current land uses in the surrounding catchment are forestry, grazing and manufacturing. Conservation Measures: A Preliminary Management Scheme has been operating since 1997 on the site. Hunting is prohibited in the lakes and a buffer zone up to 200 m from the shore. A number of laws define the fishing regime and protect the riparian vegetation. The Ramsar Management Guidance Procedure was applied at the site. This site was included in the Montreux Record of priority sites for conservation action in 1990. Following a meeting between the Greek government and the Ramsar Bureau in March 1998, an Expert Group was convened to review the conservation status of all Ramsar sites and make recommendations on the possible removal of sites from the Montreux Record. The report of the Expert Group was received in March 1999 and formed the basis of Resolution VII.12.1. As the result of the aforementioned report this site remains listed on the Montreux Record. Adverse Factors: Water quality in Lake Koronia is gradually being degraded by the development of manufacturing units in the catchment area and the lack of sewage treatment. Agricultural run-off and discharge of effluents from the numerous animal breeding farms and industrial units of the area is detrimentally high, especially runoff into Lake Koronia. A massive fish kill in Lake Koronia, occurred in August 1995. A month later, many birds, especially ducks also died. 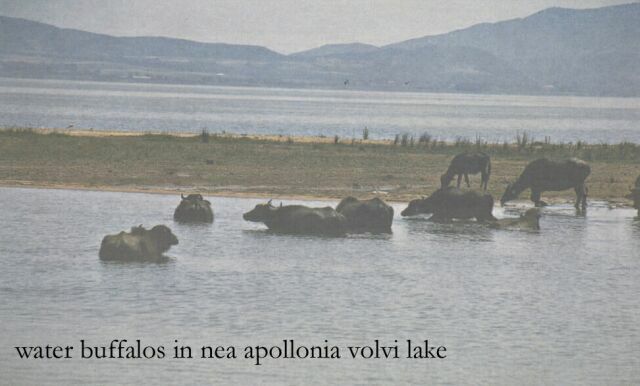 In the last 30 years, 14 plant species have disappeared from Lake Koronia (including all the benthophytes) and two have been lost from Lake Volvi. Site Management: No single body legally responsible for the direct local conservation of the wetland exists. The Preliminary management Scheme is guided by a Joint Committee presided by a representative of local authorities. Secretarial assistance is provided by Information Centre of Koronia Volvi, Apollonia, GR-570 20 Lagadikia. Tel: +30-393-41309, 41310, Fax: +30-393-41800. Based on the 1998 Ramsar Information Sheet. Please see "Site Description" in the Introduction for more details about the structure and content of Directory descriptions.